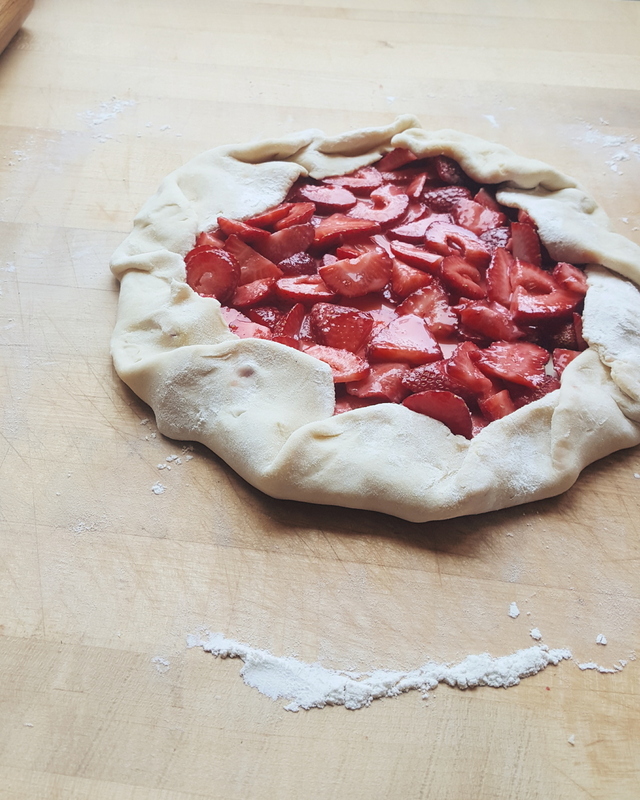 For 2016, it will be a strawberry galette paired with a haiku by Lindsay Adkins. Congratulations, Lindsay!! Birthdays are always a little bit wonderful and melancholy, or as Elizabeth Bishop likes to say, "awful but cheerful," so I'm happy to be extending some good cheer out into the world while I take time to reflect, too. This time last year, I was about four months pregnant and struggling to regain my appetite after a nauseating first trimester. I was also still working on the cookbook manuscript. What a difference a year makes, my friends. The Eat This Poem community couldn't have picked a better haiku to win this month's contest. Although 17 syllables feels short (and it is), it's a welcome challenge to create a world, a story, and an emotional resonance in such a brief container of a poem. Strawberry season is a wonderful, fleeting stretch of time I look forward to each spring. When I'm not eating them straight from the carton, strawberries find a home in desserts like this one, inspired by Smitten Kitchen's berry galette recipe from a few years back. Make dough: Pulse the flour, salt, sugar and zest together in the bowl of a food processor. Scatter the butter on top and process until incorporated, and the largest bits of butter are the size of small peas. Add the sour cream. With the motor running, pour in the water and process until the dough comes together. Turn dough out onto a cutting board and, with floured hands, press into a smooth ball. Wrap in plastic and flatten into a disc. Chill for at least 1 hour, or up to 48 hours; remove from the fridge 10 to 15 minutes before rolling. To assemble, heat the oven to 400 degrees. On a floured counter, roll the dough into a round about 14 inches across; transfer to a parchment or silpat-lined baking sheet. Stir together all of the filling ingredients and spread them in the center of the dough, leaving a 2-inch border. If you’re making a round galette, fold the border over the filling, pleating the edge to make it fit. Brush with the buttermilk and sprinkle with sugar. Bake for 30 minutes, or until golden. Remove from the oven and let stand for 5 minutes, then slide the galette onto a serving plate.